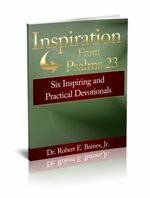 Edification, as used in this devotional, is concerned with building up others. It includes praying for, encouraging, and supporting others, as they strive to live by God’s will. In this devotional, let's focus on the good work of helping others be strong in obeying God. A good work that you should be involved in is that of helping others grow in the Lord. You should be able to point to someone who you can truly say that you are giving serious effort to building up in the Lord. Your efforts may include being an accountability partner, “hello,” being a teacher, or ministry manager. A good work that every believer can be involved in is that of helping others grow in the Lord. 1. On a scale of one to five, with five being high, how would you grade your involvement in building others? Why? 2. What are some of the things you do well, in this area? 3. What are some things that you need some help with, in this area? 4. What are you going to do to improve in this area? Great and awesome God, the One who has saved me, so I can be a part of helping others grow in the Lord, it is to You that I pray. Thank You for saving my sin sick soul. Thank You for the privilege of serving You but helping others be strong in obeying Your will. I admit that I have too often fallen short in doing this type of ministry as well as I could. Please forgive me and help me to do the good work of edification better. In Jesus’ name, amen.